Now that the weather is starting to turn for the better (don’t mind that pesky rain), all I can think about is eating and drinking outside. And in Washington, where the appropriate outdoor dining season is about two weeks long, it pays to be organized. That is why we’ve put together our favorite spots to sip a beer or have a bite on a patio, deck or sidewalk. Enjoy them, but if you take the last table at one of our favorites, we’re going to be seriously mad. Addison: Although it tends to fill up quickly, one of the best spots for both value and people watching is the patio at Arlington’s Mexicali Blues. 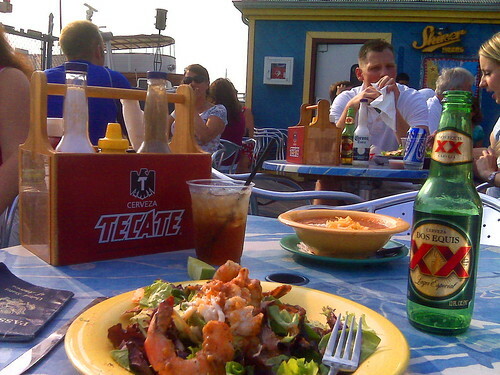 There’s no better way to while away a summer afternoon than with $2 Mexican drafts and $4 margaritas. If you prefer substance over style, check out the covered porch at Jay’s Saloon and Grille. The AstroTurf and plastic patio furniture lend to an ambiance that might be more suited to a trailer park, but $10 domestic pitchers and a decent food selection make this a favorite. Rebecca J.: Cleveland Park Bar & Grill has a fantastic rooftop deck with flat screen TVs housed under a deck rooftop, so you can be in the sun and watch the game sans screen glare. Katie: Although I wouldn’t recommend eating anything here, really, the finest outdoor seating I know of around these parts is at Indigo Landing, overlooking the marina and National Airport. I’d order drinks, maybe some fries, something the kitchen can’t mess up, and stay on the deck for as long as they’ll let you. Marissa: It’s probably cliche at this point, but eating at Lauriol Plaza is delightful during the summer. Grab some enchiladas and split a pitcher of their frozen margaritas and you’ll completely forget about the surrounding noisy 18th street. Yes, you’ll have to wait for a table, but I repeat: go for the margaritas and time will fly. Brittany: There is a sort of joke amongst my friends that I am afraid of the outdoors. It is not exactly true – but I am kind of a whiner about summer humidity and such. Blame it on moving back here from San Francisco where I did not have to deal with my hair curling up as soon as I set foot outside. For my occasional outdoor drinking (other than apartment terraces and roofs), you might catch me on the back patios of The Gibson or Little Miss Whiskey’s, or, perhaps, making an extra-rare sunlight appearance to sip coffee at one of the lovely sidewalk tables at Big Bear. Tom: Alexandria’s Columbia Firehouse has one of my favorite hidden spots, a three table patio out of the way of the rest of the world. In the springtime, when the ivy comes in, you’d swear you were anywhere but Northern Virginia. Color me also in love with the outside tables at I Street’s The Bottom Line. Sure, it’s a hole in the wall, and I don’t think I’d recommend the food, but the drinks are strong, the tapped ales flowing, and the service is strong. 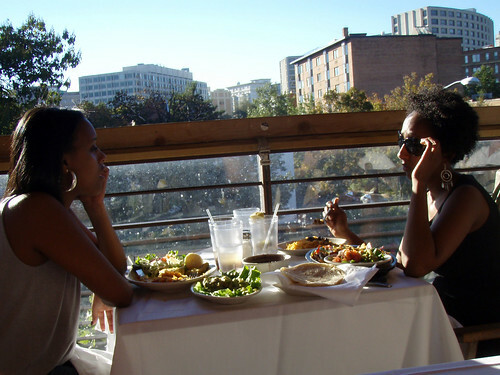 Ashley: I’ve already waxed poetic about the patio at Zorba’s Cafe in Dupont, and the long tables at Brasserie Beck are perfect for leisurely happy hours with friends, but my absolute favorite outdoor spot in town is the back patio at Poste. It’s a little oasis in the middle of Chinatown, and the food ain’t bad either. Sitting under one of their umbrellas with a nice gin and tonic is just about the best way I know to ring in the sunny weather. Jenn: The first sunny afternoon I can sip a dark-n-stormy at the battered outside bar at Cantina Marina is heaven. There’s something about it – completely unpretentious, a total ramshackle structure that seems out of place in DC. Maybe it’s the sparkle of the sun on the water, but it instantly calms me down. My SW friends hate it every time I mention “their secret” bar, but my hope is that someday the much-anticipated Waterfront development will bloom with places like this. Maybe that’s a fool’s hope. But lolling around an afternoon in a sundress, sucking back the simplest mix of rum and ginger beer, while neighbors and regulars mix with happy puppies and kids, well, it gets even this hard urban heart of mine every time. That Potomac River breeze sure helps. So those are our favorites, did we miss any of yours? Yes, by all means go to Lauriol Plaza. In fact, stand on the sidewalk blocking foot traffic, clog the streets trying to get into the miniscle parking lot, toss away your hardearned moolah on overpriced sugary margaritas, and wait two hours to eat your bland enchiladas. Lauriol Plaza’s not the cliche — it’s patrons are cliches. 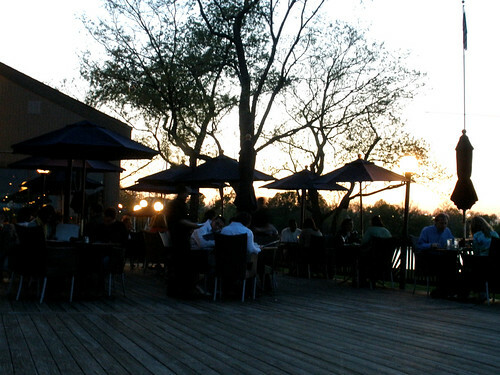 You may want to try the patios at Ceiba or Ten Penh…same restaurant family, drinks are great and the staff rocks. Sort of going a different route here, but the best place for an outdoor drink is the Red Loft at Nats Park! Dining outside is exciting it is very different from usual. You can see different people, views and sceneries, it is perfect for family and friends. In my case I often eat in that place whenever I am stress. 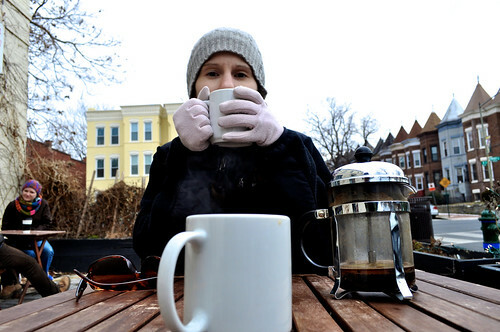 The patio at Old Glory in Georgetown is my favorite spot year round! I am not certain the place you are getting your info, however great topic. I needs to spend some time learning more or understanding more. Thanks for fantastic info I was in search of this info for my mission.